Inspired by David Simon's award-winning HBO series Treme, this celebration of the culinary spirit of post-Katrina New Orleans features recipes and tributes from the characters, real and fictional, who highlight the Crescent City's rich foodways. From chef Janette Desautel's own Crawfish Ravioli and LaDonna Batiste-Williams's Smothered Turnip Soup to the city's finest Sazerac, New Orleans' cuisine is a mélange of influences from Creole to Vietnamese, at once new and old, genteel and down-home, and, in the words of Toni Bernette, "seasoned with delicious nostalgia." 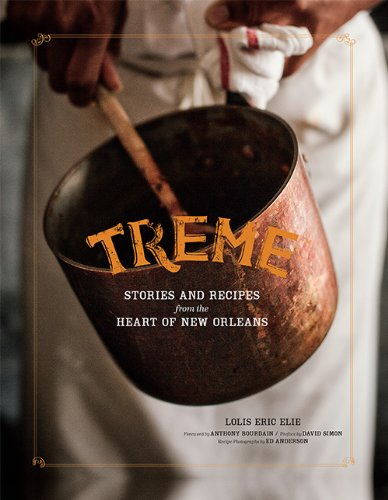 As visually rich as the series itself, the book includes 100 heritage and contemporary recipes from the city's heralded restaurants such as Upperline, Bayona, Restaurant August, and Herbsaint, plus original recipes from renowned chefs Eric Ripert, David Chang, and other Treme guest stars. For the 6 million who come to New Orleans each year for its food and music, this is the ultimate homage to the traditions that make it one of the world's greatest cities. You can see and learn more here.